Clinicept® Hand & Surface Sanitising Wipes have been specially formulated for use in medical, clinical as well as various other environments. They have been rigorously tested and proven to kill 99.999% of bacteria (EN 1276). 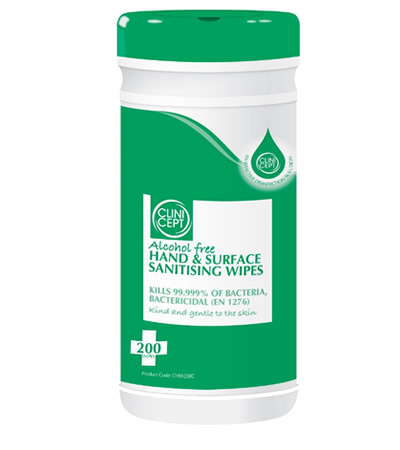 These universal handy wipes contain an effective alcohol free multi-purpose solution which can be used for cleaning and disinfecting hands, surfaces and equipment. This multi-functional product replaces the need for separate detergent, disinfectant and hand cleaners and is ideal for use in Hospitals, Nursing care homes, Food preparation areas, Laboratories, Optometrists, GP Surgery tables, Veterinary surgery tables, Trolleys, Gymnasiums, Offices and many other areas. We would like to hear about potential UK & International trade opportunities for Clinicept®Hand & Surface Sanitising Wipes. If you are interested in distributing this product, please click here to contact us by email.